When was the last time you did something for the first time? Though I appreciate the comfort of routines, especially with two small kids, I always try to answer this question with „not more than a few months ago“. And since I'm not the kind of person who constantly buys new gadgets, jumps out of planes with a parachute or loves to try out crazy food, my „first times“ are most frequently connected with new horizons. Traveling to distant shores, seeing places for the first time and exploring uncharted terrain deliver the kind of experiences to me that the person who coined the initial question surely had in mind. Broadening one's mind, constantly redefining one's role in our planet and developing humility and wisdom – these are the reasons for me to travel to new places, apart from being exhilarating experiences with loads of fun, of course. Here is the most recent chapter of this story: A travelogue of another trip of a lifetime to the Pacific Northwest of the United States, part 2 – Oregon. As far as landscape photography is concerned, there are very few states in the United States that evoke a similar yearning as Oregon. The region has it all – diverse and scenic shores, temperate rainforest and other types of alluring forest, volcanos, mountains and lakes, waterfalls, high plateaus and sand dunes, canyons and grassland. This confronted our merry little party with another episode of the route finding dilemma: You could easily spend the entire Oregon section of our trip driving the coastal highway from south to north and would pass enough incredible natural sights to fill weeks. Or you could drive through the Cascades and indulge in deep forest and mountain paradises. Or you could head for the open lands in the east enjoy the silence of desert and prairie life. Plus: in none of these routes you’d already seen the Columbia River Gorge on the northern state border, which would alone allow for at least a week of waterfall hunting and exploration. So what to do? Our plan was to pick some of the best stretches of coast, the Boardman Coast just north of the border to California, and then head for the inland. From Crater Lake we’d crawl up the Cascade Range to visit Bend, the Three Sisters Wilderness and reach the Columbia River Gorge in the Mt. Hood Area. This unfortunately meant to skip the vast majority of the coast (see you next time, Cannon Beach and Cape Kiwanda) and to totally omit the East. Hard but necessary on a first exploratory trip to a region. So instead of mourning about what we could not see (well, most of the time) we were looking forward to the wonders we would see. We entered Oregon at the southwesternmost point possible, the US 101 between Crescent City (California) and Brookings (Oregon). Adjacent to the flats of the Smith and Chetco River estuaries lies a spectacular stretch of coast where the mountains directly touch the ocean. 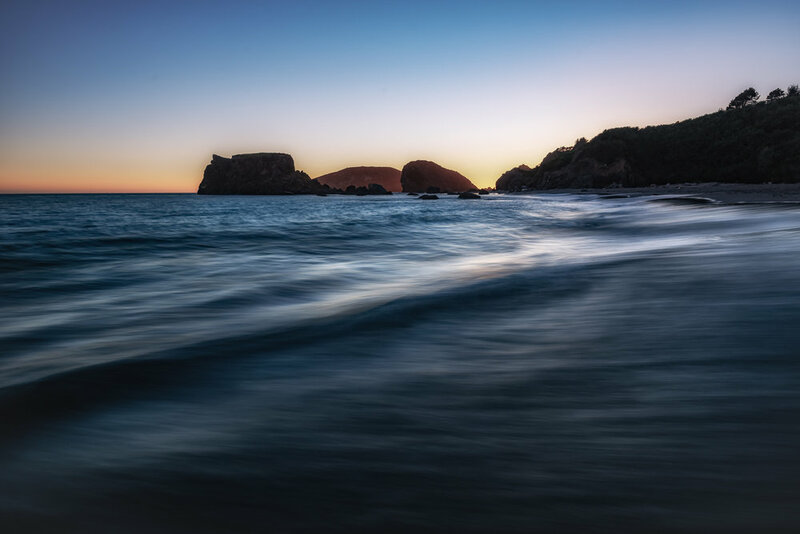 The Harris Beach State Park just outside of Brookings marks the entrance and the majority of the next 15 to 20 miles is protected as the Samuel H. Boardman State Scenic Corridor. Sounds exciting, does it? And the landscape really lives up to this pompous name. Staggering cliffs, impressive sea stacks, secluded beaches, lush forests and relentless waves define this pristine coast. Access is easy and difficult at the same time: Along the 101 there are numerous pullouts that allow for short walks to viewpoints high on the cliffs. Within only a few minutes at each stop you get a fairly well overview of the coast. But if you’re not content with the one possible perspective from the viewpoint – what landscape typically are not – it can be quite a challenge to find different compositions. Scrambling down the cliffs through thick bushes is not for the faint-hearted, but I suspect that a few days of exploration would yield extremely exciting compositions. I did not do this because of lacking time and being good company for my family. The Boardman coast has been a thrill to see nonetheless. On our one and only afternoon there we steered our Motorhome to several viewpoints at the coast and found the Arch Rock Picnic Area to deliver the best instant experience. At the northern end of the corridor a viewing platform enables you to look south above a longer stretch of the coast with a beautiful unspoiled beach and quite a few stacks and cliffs in the frame. It was quite a sight to see already in the afternoon, but I suppose a winter sunset would make an incredible photo opportunity here. Looking at the maps and trail descriptions once again while writing this article I feel the itch – the STRONG itch – to revisit this stunning area again for at least a week and explore every inch of it. We were camped near Harris Beach State Park this night so this beach was the obvious choice for sunset after a not-even-mediocre dinner in Brookings Harbor. Harris Beach is like a soft introduction, a lovely overture to the spectacular scenery that follows further up north. While the light was not as charismatic without any clouds our moments were definitely spent well that evening! Next morning we headed east and stopped for a final walk in the Redwood Forests. The only reasonable option to drive inlands from the Boardman Coast is to head back into California and take the 199 in northeastern direction. Passing through the Jedediah Smith Redwoods State Park we were coming full circle as we once again witnessed the giant trees were we saw them for the first time. We decided to hike a small loop in the famous Stout Grove before driving deeper into Oregon. Walking among giants will definitely be a memory of a lifetime for all of us! Our destination for that day was the tiny settlement of Union Creek a few miles east of Crater Lake National Park. This meant that we drove back into the forests and volcanoes of the Cascades Range. Initially we planned to stop at the Oregon Caves National Monument for yet another new horizon – albeit a subterranean one – but we skipped this idea in the Monument’s Visitor Center in Cave Junction. On the one hand this would have meant at least two hours additional driving and on the other hand we were told that our kids are too young to be allowed for the majority of the caves. Yikes! So no caves. In the spirit of not driving the whole day, this was perhaps a good thing. This did not mean, however, that we opted out of every scenic stop that our route offered. I was reading the brilliant book “Photographing Oregon” – I had its siblings “Photographing California, Vol. 1: Northern California” and “Photographing Washington” with me too – in every free minute on the road and it revealed a wonderful stop only half an hour before our final destination for that day. The Mill Creek Falls Scenic Area boasts several rapids and falls at the confluence of Rogue River, Cod Creek and Barr Creek, plus we were able to get a firsthand impression of the dense, dark and alluring Oregon forests on the leisurely 10 to 20 minutes walk to the falls. The sun was still high although it was late in the afternoon so we faced the challenge of having direct sunlight on the falls which are located on the western wall of the small gorge carved by the Rogue River. It was a joy nonetheless and we scrambled on the rocks, walked through the forest and gazed at the waterfalls with big eyes. I was especially proud of my daughter who was determined to create a decent photo of the falls, which meant she grabbed my tripod and made her serious face while pretending to adjust the composition and the settings! I personally liked the Barr Creek Falls best, although I had to force myself to the limits of my acrophobia and perch on a high cliff to get the best view of the falls. It is not an especially exciting fall, nor did it offer unique possibilities for composition, but hey – it’s been my first Oregon waterfall! And something about falling water and pristine forests that just makes me happy. The night at Union Creek was especially delightful as we decided overrun our bad dinner memories of the night before in Brookings with another restaurant experience. The nice guide at the Oregon Caves National Monument Visitor Center warmly recommended Beckie’s Café at Union Creek. When arrived at the small settlement – essentially an outpost that is turned into a nostalgic little resort – we could not help but follow her tip. Beckie’s Café is rustic yet comfortable and the food is gorgeous. Whenever you pass through, be sure to make a stop at least for her famous pies! Having said that I must admit I liked her grilled tuna sandwich even better. One mile north of the outpost lies the junction to the Crater Lake Highway, which we took the following morning. After registering at the entrance office we headed for the rim village for a first glance of the eighth wonder of the world. It is hard to describe the feelings when you stand on the rim for the very first time and just stare down into this HUGE bowl of pure blueness. Mesmerizing for sure, somehow deafening for the eye. To be perfectly honest, I was amazed and disillusioned at the same time. It’s easy to be extremely impressed by the scale of the place, an almost 10 kilometer wide bowl filled with 17.5 square kilometers of pure water. On the other hand I struggled to find it a beautiful place for the very same reasons. The sheer size of the bowl, the rigorous horizontality of the crater’s edge devoid of a mountainous skyline, the lack of lush vegetation – all this certainly made it an impressive first sight, but beautiful only at second sight for me. We decided to stick to terrain although the determining topography of the lake is essentially flat. So we drove east along the rim towards the highest point in the park, Mt. Scott. Being a volcano in its own right it offers striking views of the caldera of his larger brother. The summit is 2722 meters above sea level and therefore roughly 850 meters above the surface of Crater Lake. Hiking up Mt. Scott is popular, as the trial is not very long albeit steep in some sections. From the top you have a striking view of a vast section of the Cascades Range – from vague hints of Mt. Shasta deep in the South to Mt. Thielsen and even the Three Sisters in the North. On the eastern flanks of Mt. Scott the Klamath Marsh National Wildlife Refuge stretches out and in the west Crater Lake with Wizard Island and the Watchman dominates the views. This would certainly be a worthwhile location for the shoulder hours of the day at dusk or dawn. After the descent we took the western rim road and stopped near the Watchman for another close look onto the lake. It was there that I realized that the Lake had a photographic potential for me beyond looking epic in epic light. There was a light breeze on the lake’s surface and the small ripples caused a wonderful interplay of all shades of blue. It was fascinating to witness that the lake is not just blue, but that the blue is a mirror of the sky – and when the mirror is fractured the blues are split into millions of sub-tones. Additionally, this segment of the lake features some rare shallow sections in the Skell Channel near Wizard Island where you could see through water onto the ground. This offered a whole new set of colors and abstract shapes. 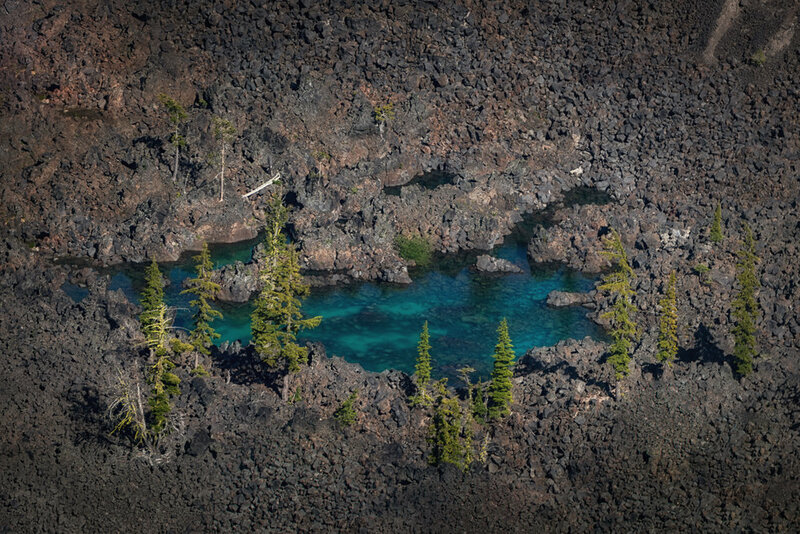 Wizard Island boasted a few tiny ponds and pools which reminded of the both ancient and new earth of Galapagos, although I have never been there. It is weird how something that is this new (geologically) appears to be this ancient and primordial: a shallow Pond of rainwater on Wizard Island in Crater Lake. After the very open and dry landscape of Crater Lake we were yearning for the forests, streams and lakes again. So we decided to spend the evening at two spots in the Umpqua National Forest north of Crater Lake National Park. First stop was Diamond Lake whose eastern shores offers amenities like picnic areas, a small marina and first class views of Mt. Bailey in the west. We parked at the Diamond Lake Campground for some hours, enjoyed the warm afternoon sun, took a swim in the cool lake and prepared a dinner with a view. These were definitely some of the happy hours of the trip. As there was no chance of nice sunset light I opted for another plan for the evening. A dozen miles north and west on the OR-138, the Oregon forests hides a true gem of a waterfall, Toketee Falls. You pass several signs for other falls on this segment (a lot of them very beautiful supposedly) but I wanted this one. The forest is very dense and dark here and the valleys carved by the many rivers convey a remote, primordial atmosphere. From the parking lot, which we reached exactly at sunset, it is a 15 minute walk on a well-maintained trail to the falls. The light was fading and we jumped above boulders and roots, climbed steps and finally reached a small viewing platform that was built around a few large trees above the bowl of Toketee Falls. The North Umpqua River flows above basaltic lava and eroded a double blowl. The first bowl is carved directly into the basalt layer while the second is much larger and caters a pool and lots of trees. What makes the falls special is – beside the two steps – the spectacular view into the geology of the area. I have rarely seen basaltic columns as dramatic and alluring as here. At the end of the trip, this will be my most favorite waterfall. The following hours were spent on the road to reach another spectacular region of Oregon – remember our time frame allowed us a week for this entire State! From the OR-138 near Crater Lake we headed north on the US-97 and then took a left turn to the drive the Cascade Lakes National Scenic Byway. Doesn’t that sound fantastic? Yet another example a tremendously alluring name for a simple stretch of tarmac! Our following two nights were spent at Lava Lake, which is a little further south of its famous sisters Elk Lake and Sparks Lake. From the Lake you have clear views of Mt. Bachelor, Broken Top and South Sister in the distance. On the second night I spent two hours around midnight on the small boat launch and gazed at the stars. It was almost full moon so the starry sky was not that significant, but it’s been an experience nevertheless. The day we spent at Lava Lake was the first day of the trip where we did not move our vehicle. Instead, we took it slow and explored the immediate surroundings. This included a hike up to Lucky Lake, a leisurely walk to Little Lava Lake and – most importantly – a canoe session on Lava Lake with/for the kids. I’ve done some canoeing and kayaking in Germany, Poland and Sweden a few years ago, but for the little ones this was a whole new thing. Bursting with pride and excitement they entered the canoe and enjoyed the hour on the lake. It was perfectly calm and birds of prey were circling high up. On the way back the sun was slowly coming down and allowed for the shadows to creep further into the deep woods. I managed to get some decent images although the interplay of light and shadow was still challenging. Back in the motorhome and on the way to Bend we quickly decided to repeat our strategy of Toketee Falls and visit another waterfall after sunset. We chose Tumalo Falls about 13 miles west of the city of Bend. Tumalo Creeks has its source on the eastern slope of Broken Top, falls spectacularly a few miles further east and joines forces with the Deschutes River at Tumalo State Park north of Bend. On its short voyage the water makes some serious noise, especially during its 100 feet (30 meters) of free fall at Tumalo Falls. Access is easy as you virtually park at the view point. This also means that highly original compositions are not what you gonna find at this place, but simply experiencing this waterfall with all your senses is bliss. From Bend we opted out of the Northern Oregon Coast and headed north for the Mt. Hood region while staying in the Cascades all the time. This sounds like an easier undertaking as it actually is because of the abundant diversion from the uncountable possible photography stops. One of those stops that I did not want to miss was Proxy Falls, probably the most famous waterfall in Oregon. It's one of these cases where you fight a battle within your head whether to visit an iconic spot or to leave these locations for the masses. 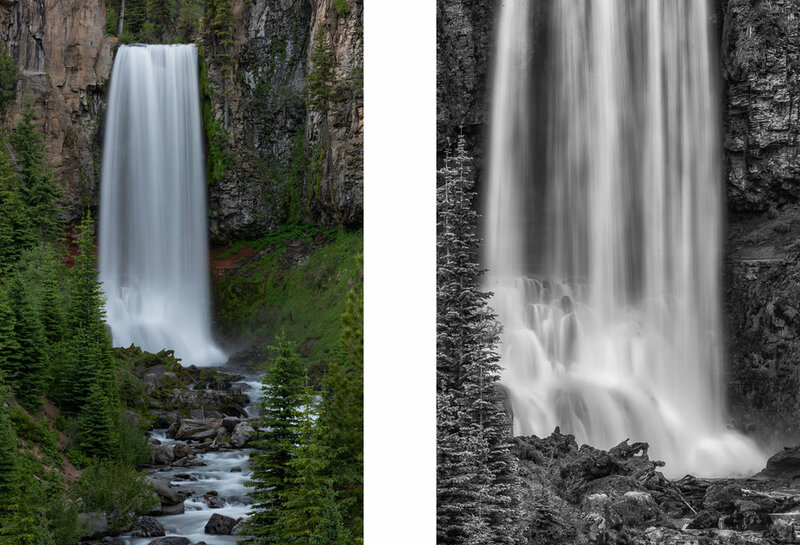 In the end Proxy Falls proves that most often the icons have become iconic for a reason and if you manage to fade out the crowds – it was not really that bad when I visited – you instantly see why they should be famous if they were not! Even on a cloudless day at noon these enticing cascades over hundreds of basalt columns foster rushes of adrenaline to the photographer's circulation. I found my treasures when I climbed halfway up the right flank of the falls into the shade and portrayed the water flows over the steps with a long lens and the fabulous colors of the wet basalt and the vibrant mosses. Those scenes certainly rank among my favorite photographs of all time. 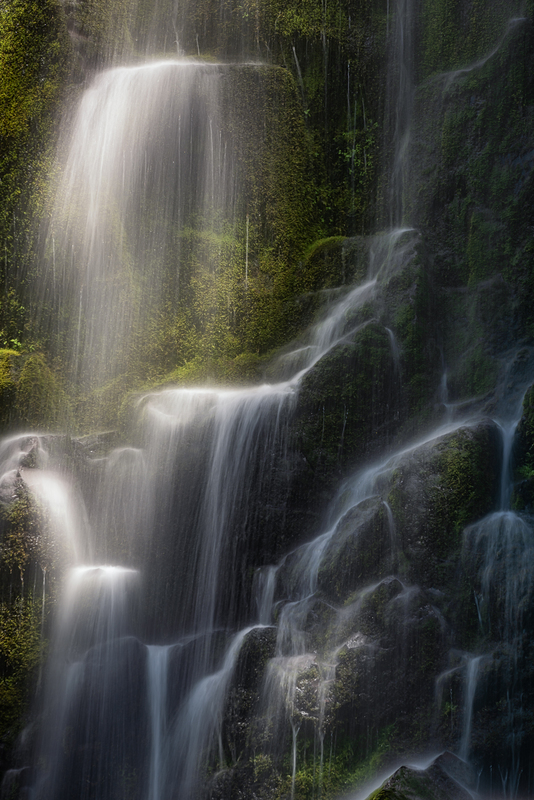 Thousand streams over basalt and moss: this pretty much sums up the magic of Proxy Falls. This might be my favourite photo from Oregon, a highly personal perspective of the basalt and moss next to Proxy Falls. Our final night in Oregon was spent in the Mt. Hood area on a calm and scenic lake called Timothy Lake. We reached it by navigating through Mt. Hood National Forest on small roads which was quite an adventure without GPS navigation. Photographically the lake – which is an artificial body of water created by a dam at the southwestern end of the valley – is not too exciting. It is much larger and lies further away from the stunning backdrop that is Mt. Hood, which was covered in clouds anyway. So the joys were different ones … flame grilled artisan burgers at the campsite and a slow and subtle dusk at the lake. Who needs epic sunsets anyway? The next day was the day of saying goodbye to magnificent Oregon. We stopped briefly at Trillium Lake, saw what the fuss is all about here and then headed for the Gorge. Crossing the mighty Columbia River via the Bridge of the Gods at Cascade Locks we set foot in another place of my dreams, Washington State. The new horizons that awaited me there were in no way inferior to what the first two weeks of the trip had to offer, but let's call the last week a bittersweet symphony. What do I mean by that? Stay tuned for the final episode of my trip report!